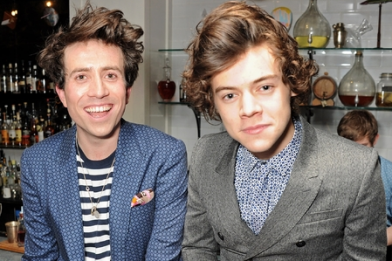 Harry Styles has been staying at Nick Grimshaw’s flat in Primrose Hill during London Fashion week even thou the One Direction hunk has a £3 million home in Hampstead, 2 miles away. Speaking to the Daily Star, a source said: “Harry may have splashed the cash on his house, but if no one’s sleeping over he hates staying there. “It’s depressing for him having the whole place to himself. He’s used to having his bandmates around because they’re normally flying all over the world, staying in hotels. It’s not just the two pals that cosy together. Harry has a speacial fondness for Nick’s pet dog Lex.